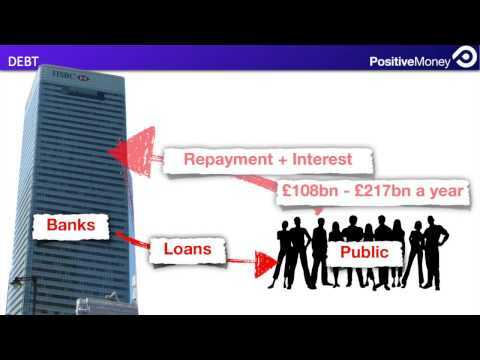 Many people struggle to grasp the concept that banks create money. The consequence of private companies creating our national currency may sound benign - but the result is perpetual debt. For digital money to exist - a debt must be incurred. Looking at the aggregate of all such debt, we know that as interest is applied, the debt continues to grow. However, the quantity of new money that was created (when the debt was originally incurred) stays the same. The consequence of this - is that our existing supply of digital money can never pay off this increasing debt. This is the very essence of economic slavery! Only the government has the right to create our national currency. Banks should only lend money that has been deposited with them. Deposits are the property of clients and not those of the bank. Depositors should determine how their money is used. Banks create digital money (as credit). The government creates all our money. Digital money is borrowed into circulation. All new money is spent into circulation. For money to exist - there must be debt. For money to exist - there is infrastructure. Banks have a profit incentive to create money. Banks earn income by lending existing money. The bank owns your deposit. You own your deposit at the bank. When you deposit money - you are a creditor. The bank is your agent and you are the principal. Banks decide how to use your money. You deceide what your money is used for. Banks offer you insurance for your deposit. If a bank collapses, you retain your money. Banks earn income from financial services. Banks earn income from interest rate margins.